This past Saturday was International Tabletop Day, a day where tens-of-thousands of people around the world crowd around tables in dining rooms, basements, clubs and hobby shops to do what many of us do year-round — play games. My youngest son and I spent the afternoon at Brooklyn Game Lab, a recent entry into the growing list of New York City venues dedicated to unplugging and playing tabletop games with friends and strangers alike. The scene in Brooklyn was like that played-out worldwide with a packed house of experienced gamers and newcomers joining together, rolling dice, racking up points, playing cards, placing tokens and role-playing through a massive variety of games. At Brooklyn Game Lab, players faced off with a variety of games like Betrayal at House on the Hill, Love Letter, The Resistance: Avalon, Tokaido and even a few games of Chess. My son and I had a go at two games which were new to us — Revolution! and Carcassonne. In Revolution! from the decades-old Steve Jackson Games players vie for power in a town through a secretive combination of blackmail, strong-armed force and out-and-out bribery. 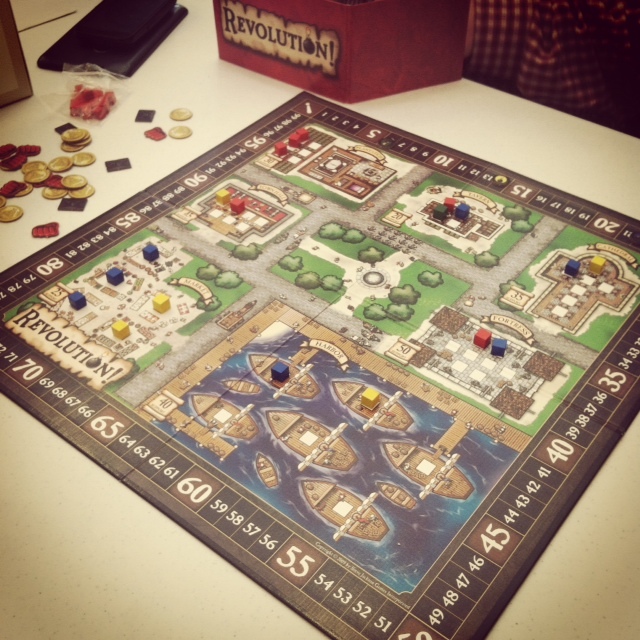 With four new players at the table, Revolution! was a quick learn and exciting fast play in just under an hour’s time. Revolution! 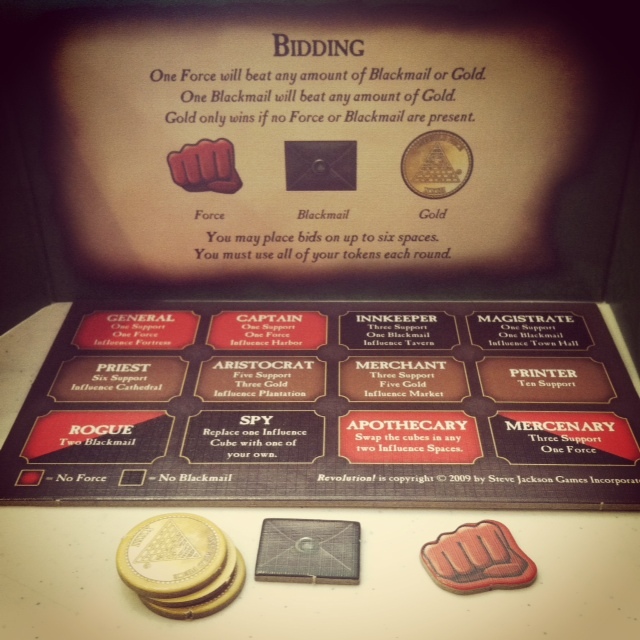 has an interesting secret bidding mechanic where players simultaneously bid their Force, Blackmail and Gold tokens on a dozen citizens of the board’s town such as the General, Priest, Printer, Mercenary or Spy. Once bids are placed, players remove their screens to reveal their bids. Bids to influence the same character are resolved through a simple Force beats Blackmail, Blackmail beat Gold and ties result in no effect for the round. Once a player wins influence over a character, the effects dealt out through additional earned Force, Blackmail and Gold tokens, Support points or placement of Influence markers in one of the town’s areas such as the Tavern, Town Hall, Market or Harbor. The game continues with subsequent rounds of bidding which progress into evolving strategies and agendas as the town’s areas fill up with player Influence. As the board is filled, players in Revolution! shift in their need for Force, Blackmail and Gold tokens, seeking to not only control the board but shift and undermine their opponent’s already-placed pieces. Controlling an area of the town brings additional Support points when the game ends, and the player with the most points on the outer scoring track wins. For our second game of the day, we got into the now-classic Carcassonne from 2000. Distributed by Z-Man Games in the United States, Carcassonne is a tile-placement game where players build-out and a kingdom dotted with cities, roads and monasteries. Carcassonne is a quick learn, and the random tile choice at the beginning of each player’s turn creates choices in matching the tile to the multiple potential fits on the table. In placing a tile, a player also makes a choice in placing a meeple on the board and in doing so, placing a bet on potential points. In placing the first tile of a city, a player may place one of their colored meeple pieces with the hope of closing off the city with additional tile plays which score points on the number of subsequently connected city pieces at a two points apiece. A monastery scores nine points when the eight surrounding tiles are placed, and roads are scored at a tile each once a route is closed between two endpoints. Victory points are tracked on a scorecard next to the growing kingdom of Carcassonne, and each tile played reduces the chances from the finite number of potential tiles in the draw pile. Playing against three experienced players in my first game, I was able to score highest on some chancy bets and lucky tile draws. 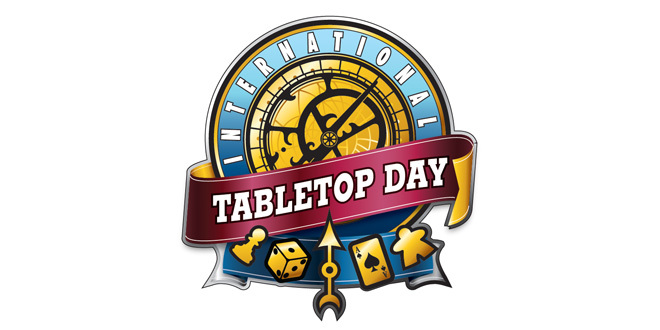 International Tabletop Day is 24 hours of celebration of games, chanced strategies played out and opportunities to try something new. At the Brooklyn Game Lab this past weekend I found myself in my element surrounded by passionate gamers questing for victory and fun and more than a few hours of play. Games focus on this one day per year, but for a lot of my fellow gamers, they play out week after week until next turn rolls around on the calendar. 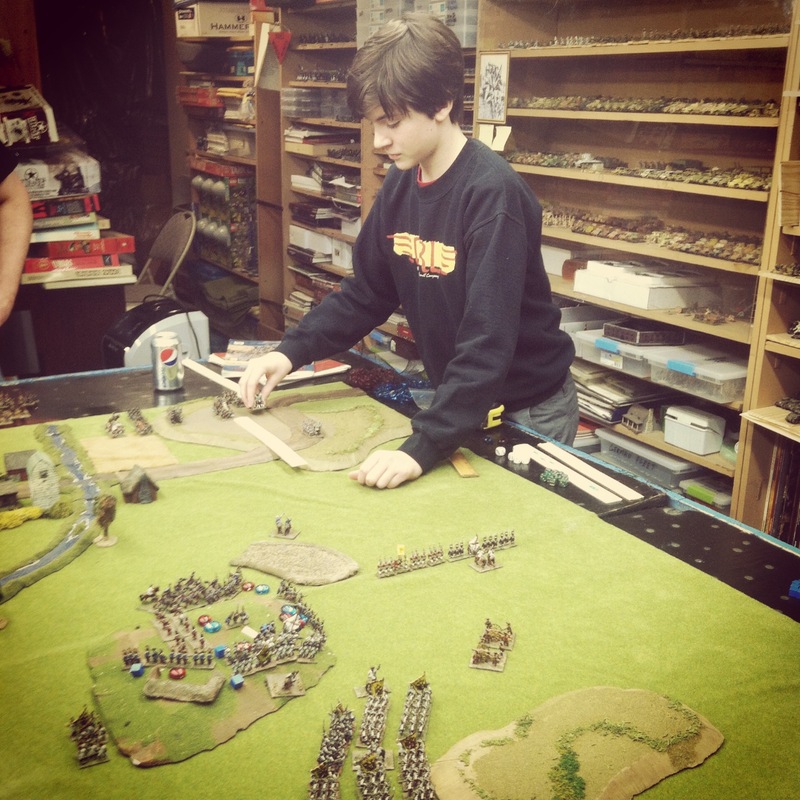 This past weekend at Metropolitan Wargamers in Brooklyn, NY, there was some focused excitement around around two big boardgames. One group of players was huddled around an ongoing campaign using the very popular Zombicide and its new expansions. Another crowd anxioulsy anticipated the arrival of the newly-released Designer’s Edition of the old Steve Jackson Games sci-fi battle classic Ogre which comes in a monstrous 30-pound box overflowing with huge game maps, 3D models and more than 500 cardboard playing pieces. At the back of the club, four of us had a go at a game of more traditional historical miniatures wargaming our club was founded on nearly 30 years ago. 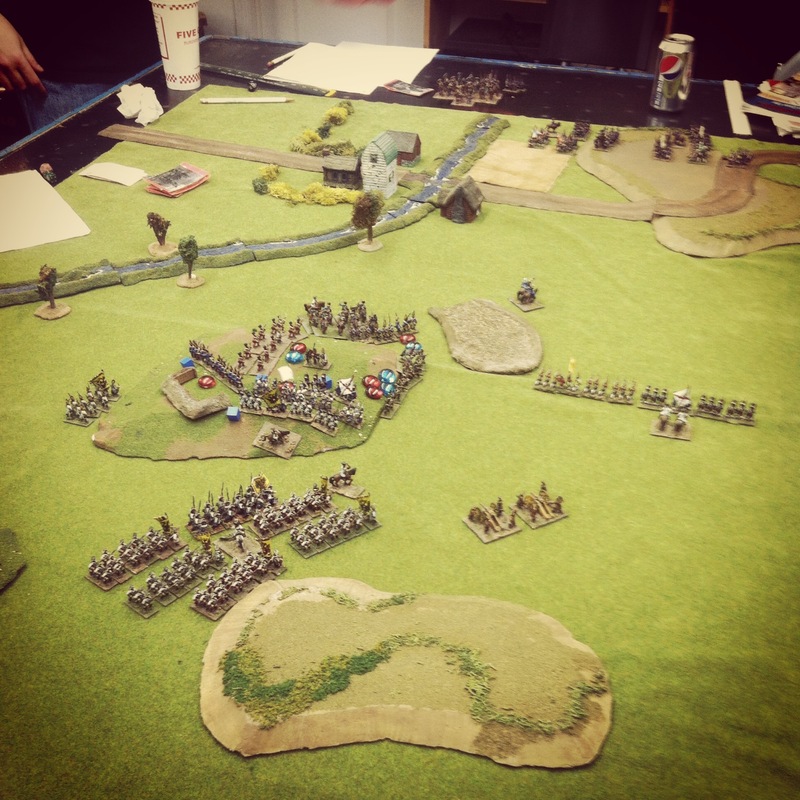 After a long hiatus, our club President had decided to blow the dust off his “Warfare In The Age Of Reason” rules from Emperor’s Press and host a few of us for a learning game of the Battle of Moys from the Seven Years War. 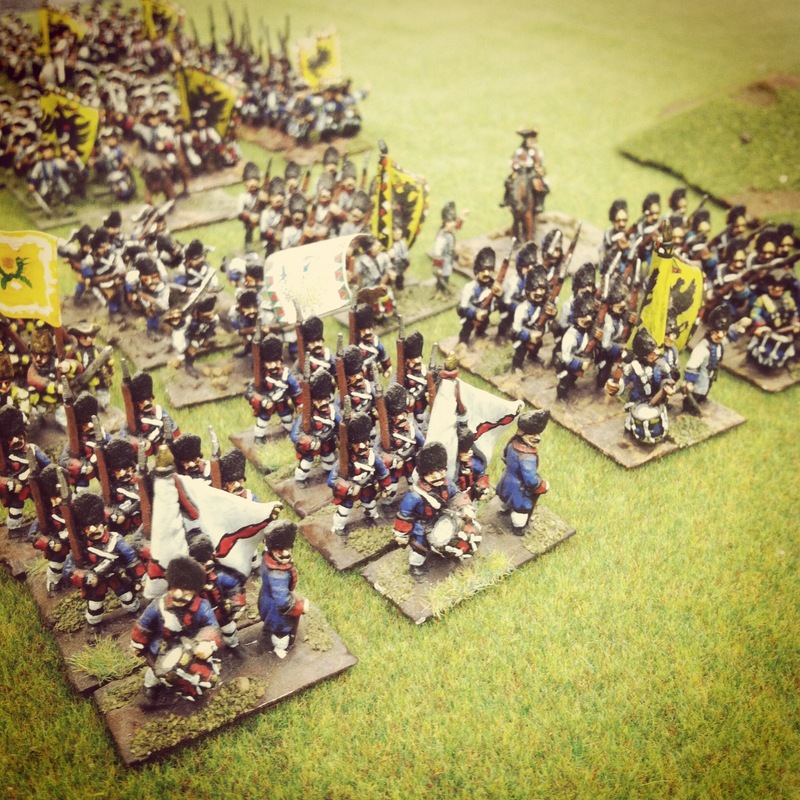 After so many hours spent with World War II miniatures gaming with Flames of War, it was great to dig into a period ruled by wigs, muskets and traditional European battlefield tactics. The Seven Years War was a different kind of world war from a very different era. Fought throughout Europe, along the West African coast and in the colonial outposts of India, the Philippines and the Americas, the war raged from 1756-1763 between various kingdoms and alliances competing for land and trade worldwide. By the fall of 1757, several major battles had already been fought including the Prussian defeat of Austrian defenders at the Battle of Prague in May 1757 and the Austrian defeat of Prussians in answer at the Battle of Kolin a month later. Near Moys in modern Poland on September 7th, 1757, a 26,000-man Austrian force led by General Franz Leopold von Nádasdy moved toward routing an isolated and retreating Prussian force half its size commanded by Lieutenant- General Hans Karl von Winterfeldt. 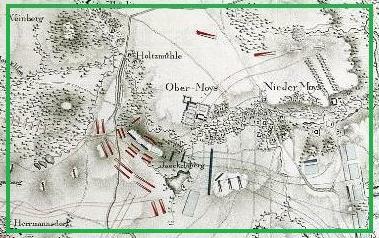 A small group of advance Prussian troops were posted on the Jäkelsberg outside of Moys but the majority of the army lay encamped at a distance. Rather than attack at first light of dawn, the Austrians waited for the Prussians to complete their breakfasts and morning drills before moving columns of Grenadiers on the defending Prussians. As subsequent Austrian waves pushed onto the heights, Hussars met the retreating Prussians. 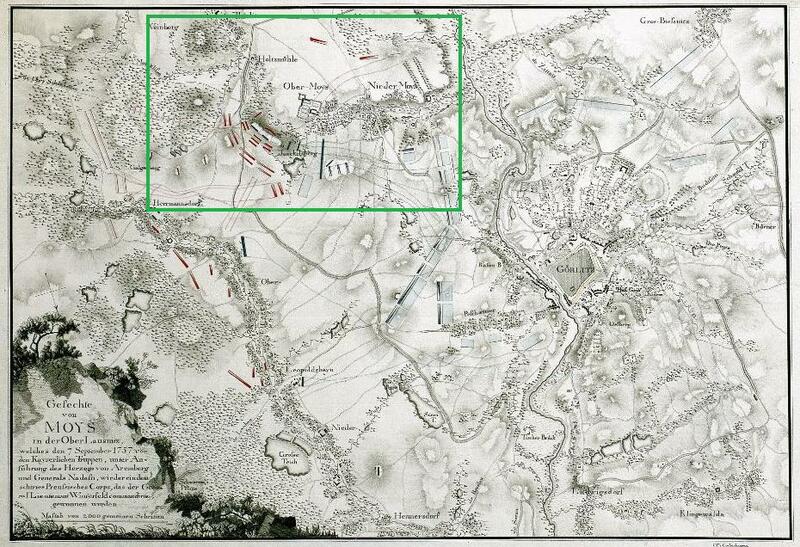 Surprised by the Austrian attack, Prussian leadership rushed reinforcements from nearby Gorlitz to the fight, briefly retaking the Jäkelsberg. The battle for the raged back and forth, but by mid afternoon the Austrians had deployed lines of regulars in the neighboring plains and forced an eventual Prussian retreat. Our game began with advancing Austrian Grenadiers and artillery moving in column on the central Jäkelsberg objective hill. With short firing range for small arms, there were a couple turns of movement and positioning from column into line as the Prussians remained stationary in their positions on the hill. 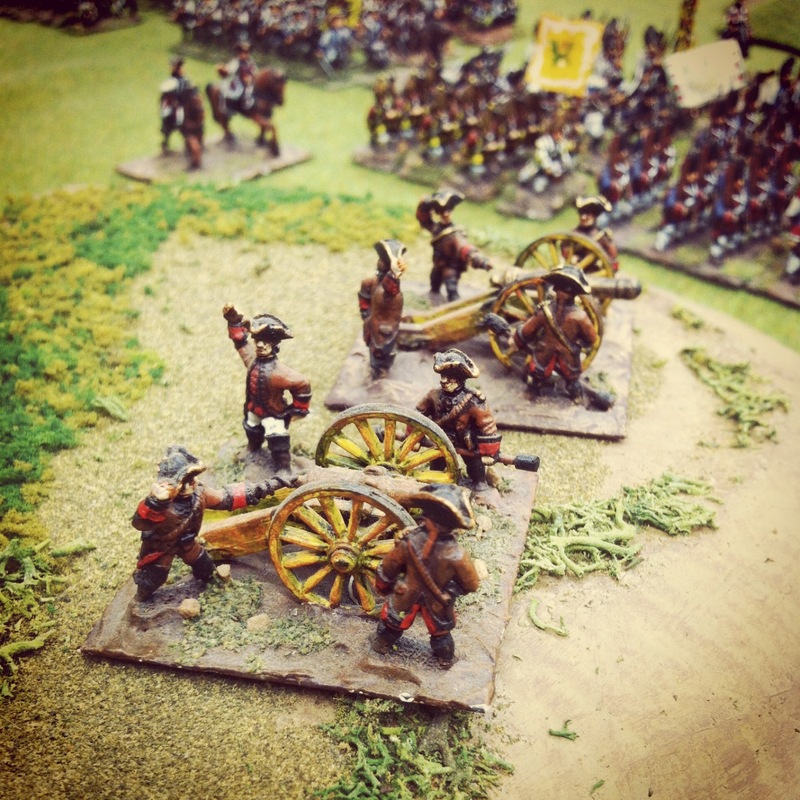 The Austrian medium cannons also began the game out of range, necessitating them to spend a turn moving and getting into position to fire on the Prussian lines. By the third turn, the lines of advancing Austrians began softening-up the Prussian left and center with musket volleys as cannon likewise opened fire. 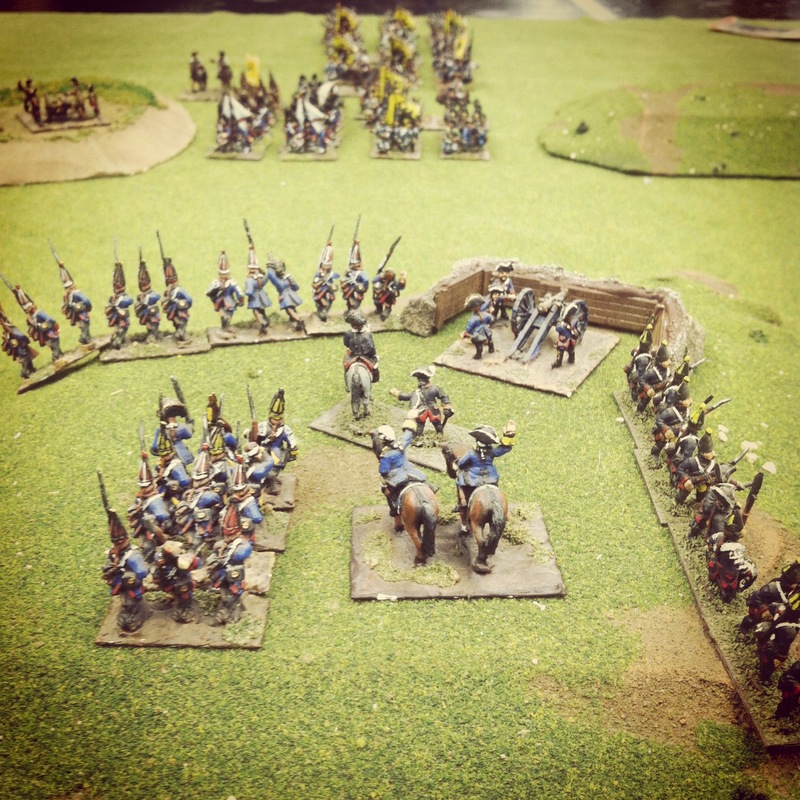 On the far side of the hill, Hussar cavalry raced to the flank and skirmishers moved toward the right lines. With things on the Jäkelsberg heights looking bad for the Prussians, fresh columns of Austrian regulars advanced on the field in turn four and immediately broke toward the open fields on the far side of the battle. On the Jäkelsberg, the Prussian cannon position was overwhelmed by advancing Austrians and the remaining Prussian infantry lines were closed in on three sides. With the Austrian objective of taking the Jäkelsberg nearky achieved by turn six, over a hlaf-dozen late-arriving columns of Prussians began arriving on the table in the distance. To the right rear of the Austrians, a Prussian cavlary contingent also arrived and moved to flank the deploying Austrian lines in the field. The Prussian cavalry made a move to charge the fresh Austrian arrivals in the rear, and one column quickly moved to defend in square formation. 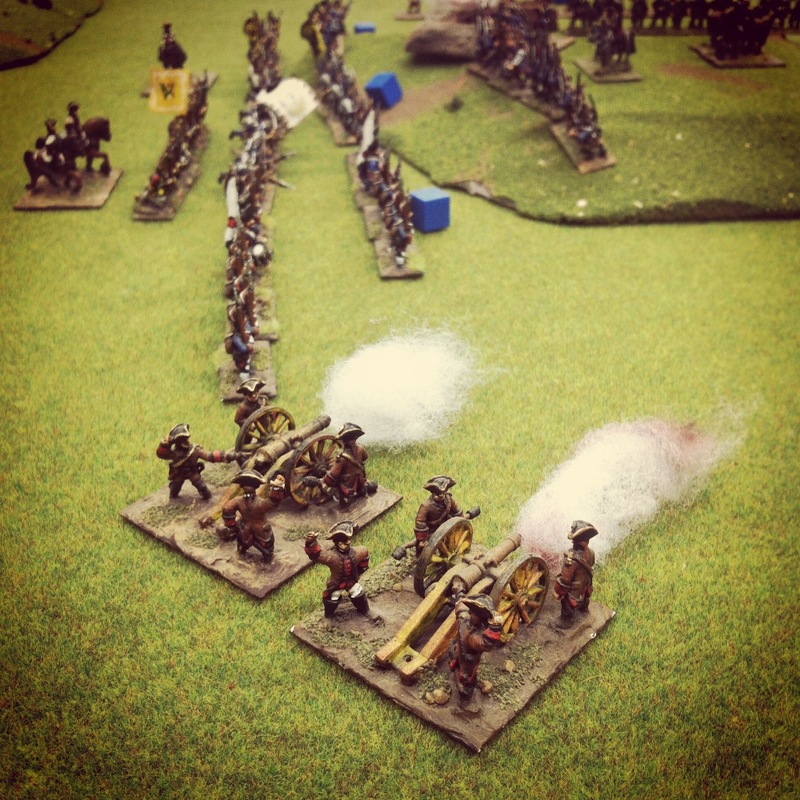 Cannon blasts from the Austrian guns routed the Prussian cavlary, driving them toward retreat off the board. By the seventh turn, the new Prussian lines were marching toward the Austrians who were already massig several ranks deep. With the Jäkelsberg held by the Austrians and their lines likewise controlling the open field, we called the game with a repeat historical victory for Austria. The Battle of Moys was my first time playng with the popular “Warfare In The Age Of Reason” rules. 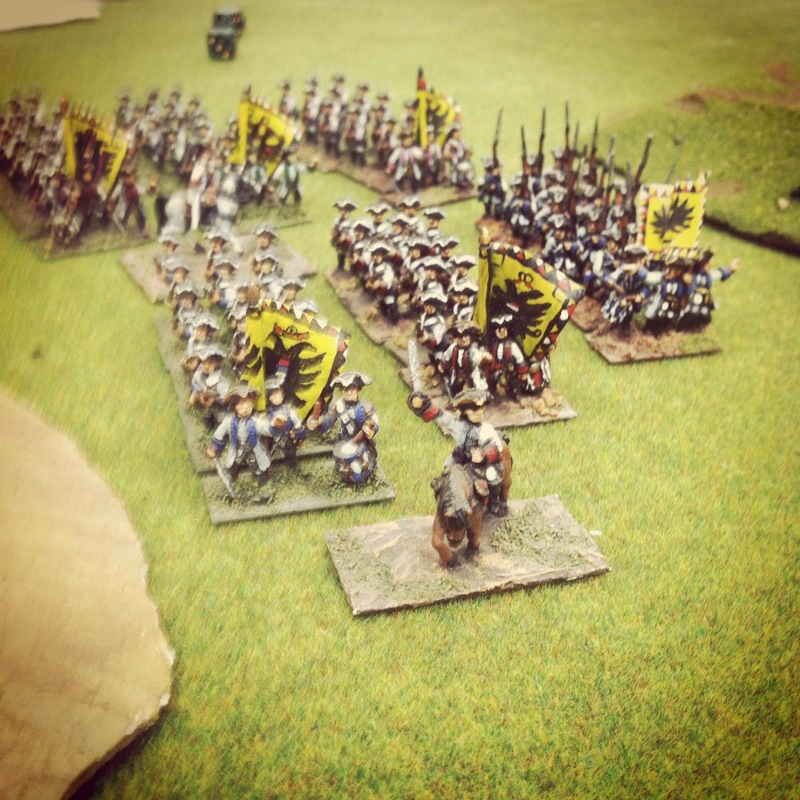 Having not played a pre-20th-century miniatures game in quite some, I loved the tactics of movement, fire and charges. In the period and game, fighting occurs at very close range, making movement and protecting flanks and rear key to victory. Forcing your opponent into disorder or routing becomes as important as the number of casualties inflicted. I found the rules to be simple, with the move order determined by drawn cards. Dice throws for morale checks, arms fire and charges all occur with a simple mechanic of adding or subtracting the number of dice according to the position and condition of your forces. Fighting in close quarters causes the battlefield to quickly shift throughout the game as lines and columns ebb and flow for position on the board. With the fairly large scale Battle of Moys under my belt, I’m looking forward to studying up on the “Warfare In The Age Of Reason” rules and Seven Years War period a bit more. 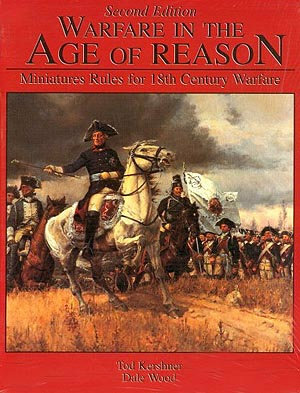 The 18th-century tactics, colorful troops and special rules according to nationalities and fighting quality provides for a ton of unique fun in a vast world war period I look to get back to again very soon. Alternatively known as “microgames,” “pocket games” or “minigames,” a number of companies created a fad in games in small packages in the late 1970s through early 1980s. These compact games came in a variety of historic, sci-fi and fantasy themes. Rulebooks, maps, cardboard chips and dice were usually packaged in hardshell cases or even simple zip-lock plastic bags. A very few of these games, like the post-apocalyptic Road Warrior-esque Car Wars from Steve Jackson Games, would see a long life fueled by supplements and expansions. More commonly, these minigames were stand-alones of vastly varying quality which faded into obscurity in a few short years. Attack Force was a simple Star Wars rip-off with one player’s force of small star fighters attempting to find the weakness in the other player’s monstrous space station to destroy it. As a fan of Luke’s attack on the Deathstar, I gave TSR a pass on the lack of originality for the chance to do some space battling myself. They’ve Invaded Pleasantville was also a two-player game, this time set in a rural village where the townspeople try to fend off alien invaders infiltrating the local populace. Each player used identical chips representing such local folk like the minister, sheriff, plumber, checkout girl and others. The trick of the game was the alien invader bluffing their way toward taking over the bodies of the locals while the town player sought to uncover who was really an alien. Revolt on Antares was a much better sci-fi-themed game and offered play for 2 to 4 players. The game presented a Risk-like map of a fictional world where six ruling “houses” with names like Andros, Dougal and Serpentine fought to rule the planet through three different scenarios. Each house had its own personality and strengths, adding a lot of variety and replay value. The ability to recruit new troops, move across varied terrain and use seven special alien weapons or devices made this little gem seem a lot more like a real wargame. Vampyre was two games in one set in the realm of Bram Stoker’s “Dracula.” The first campaign-map-style game took 2 to 6 players in the roles of Stoker’s hero characters questing to find and destroy the coffin safe-havens of Count Dracula hidden throughout Transylvania. Turning the map over, a detailed floorplan of Castle Dracula allowed another game to be played as the characters sought to track down the Count himself and destroy him. As a kid, I loved these games as a break from the longer hours spent bent over the table with my D&D campaigns. Each minigame offered its own varied mechanic, but rules were simple and limited to just a few pages for each game. The booklets, game maps and cardboard playing chips contained some wonderfully intricate small-scale artwork, much of it by popular fantasy artists of the day. While I don’t recall the exact cost of each game, I remember them being under $10 apiece and quite a deal for the hours of play we wrung out of each. These four TSR games still sit in a closet packed full of my childhood puzzles and boardgames in the house where I grew up. At the time, there was an outsized amount of fun in each little mingame package. Today, there’s still a lot of memory in each, too. Collector’s Note: Many of the TSR minigames can be found frequently on eBay selling in the $10-30 range. Steve Jackson Games makes much of their Car Wars and other microgames back catalog available for digital purchase online.